In the wake of encouraging GDP growth figures released a day earlier, Prime Minister Narendra Modi said on Wednesday that "hard work has won over Harvard-educated economists" who had predicted otherwise. The Prime Minister said the Bharatiya Janata Party is winning in Uttar Pradesh after five of the seven phases of polling, and asked the electorate to vote for his party in the remaining two phases as bonus. "Well-known intellectuals from Harvard and Oxford (universities), who have been at key positions in the Indian economic system, had said the Gross Domestic Product will go down by two per cent; some others said it will go down by four per cent," Modi said at an election rally here. "On one hand, there are these intellectuals who talk about Harvard, and on the other, there is this son of a poor mother, who is trying to change the country's economy through hard work." Whether Harvard will win or hard work -- farmers, labourers and honest people of the country have already proved it, he said. "Hard work is more powerful than Harvard. 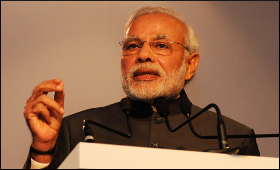 India is among the world's fastest growing economies," Modi said. "The GDP figures came out yesterday (Tuesday), and it is proved that despite demonetisation, honest and hardworking people of India -- villagers, farmers and the youths -- did not allow the country's development to get hampered," he said. The Prime Minister's remarks come in the backdrop of Nobel laureate Amartya Sen dubbing the November 8 demonetisation -- in which Rs 500 and Rs 1,000 notes were scrapped -- as a "despotic action that has struck at the root of economy based on trust". Sen is Professor of Economics and Philosophy at the Harvard University. Modi's predecessor Manmohan Singh, a senior Congress leader, too had in December called the demonetisation a "monumental mismanagement", adding that the GDP could shrink by 2 percentage points due to the manner it was implemented. India's GDP for the third quarter ending December 31 stood at Rs 30.28 lakh crore, recording a growth of seven per cent, compared with 7.3 per cent in the second quarter, official data released on Tuesday said. Speaking at the rally, the Prime Minister said: "People have made the BJP victorious in the five phases; you only have to give us a bonus in the 6th and 7th phases." Targeting the Congress-Samajwadi Party alliance in the state, Modi said: "One is expert in ruining the country; the other is an expert in ruining Uttar Pradesh. Will they be allowed to win?" He said the state will take revenge against those who looted Uttar Pradesh in the last 15 years. "I started Swachh Bharat Abhiyan across India; but the people of Uttar Pradesh took it to another level by cleaning all dirt from state politics," Modi added.